… suoraviivaisen herkullinen se on." Strong and rich, with an almost port-like character, Sametti is perfect when you want to sip something warming after a meal or when talking with friends. When accompanying desserts, goes well with cheeses like Camembert. Sametti starts in the Finnish forests, where wild blueberries (bilberries) ripen in the long summer days of July. They are then picked at the peak of flavor. That is saying something; the small wild blueberries are packed with far more flavor than the larger, cultivated blueberries. But even so, it is not easy to turn them into wine. Blueberries are a difficult fruit to ferment. Using a typical “fruit wine” method the wine will often turn out thin and with little flavor. We overcome those issues with a proprietary process that includes the use of different sugars and a method that coaxes the yeast to perform well. The bulk of the fermentation happens on the berries, extracting tannins, flavonoids and very rich color elements from the skins. It is then pressed off the solids and aged in tanks for six month before being filtered and bottled. "Un produit complet qui restera à jamais dans nos mémoires. ... Une petite expérience inoubliable." To sip after a meal or with a dessert. Very rich, with a tartness from the berries that balances the sugars and cuts through sweetness in the mouth. Great with chocolate. Or cheesecake. Or chocolate. Or pastries. Did we mention that it really goes well with chocolate? Most berry wines are diluted with a high percentage of water. Not Vaapukka where the majority of the liquid volume is pressed from the berries themselves. Fermented cool to create a rich, concentrated flavor and preserve the fresh aroma of the raspberries. The wine is then pressed off the solids, and aged in tanks for at least four months before being filtered and bottled. "Avnjut med en crème brûlée med apelsin och ni har en match made in heaven." There is no fruit that better expresses the unique spirit of Lapland than cloudberries, and Valokki captures that brilliantly in a wine. An amazingly versatile wine, Valokki complements salty foods like liver pate and cheese, spicy foods, or a wide range of desserts. For a traditional dessert with style, try it with leipäjuusto. Grapes are the only fruit that naturally contains every element needed to produce great wine when they are picked, but cloudberries are surprisingly close. We need to compensate for the lower-than-ideal sugar content, but we can then ferment and process Valokki very similar to how a grape wine is done. 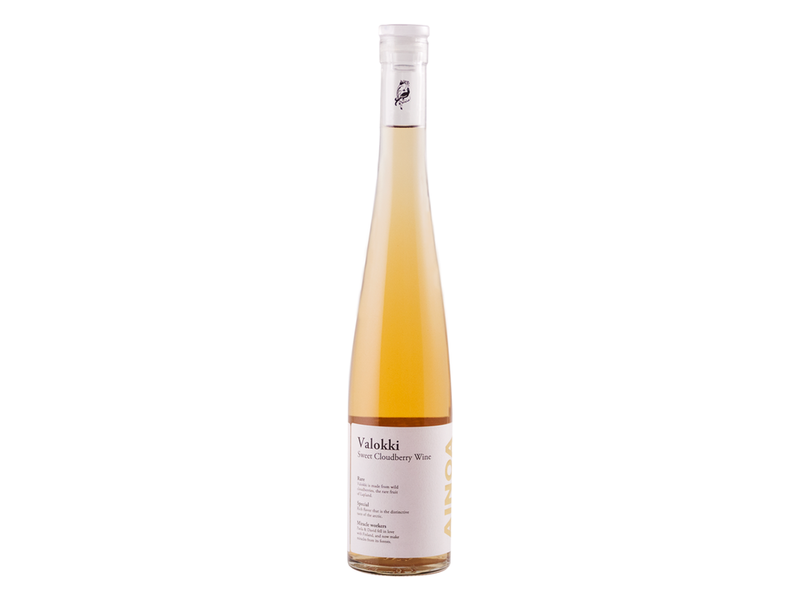 By using a high concentration of cloudberries per liter, Valokki achieves a stronger and richer cloudberry flavor than other wines or liquors. After fermentation is complete, the wine is aged in tanks for four months before being filtered and bottled. Medium bodied and fruity, yet dry. Silkki is a perfect wine to accompany game foods such as duck, grouse or venison. Wild blueberries (bilberries) are ubiquitous in the forests of Finland, growing in every region of the country. There is a long tradition of families visiting the woods in July, buckets in hand to gather as many berries as they can. These are typically baked into pies, served over ice cream, or frozen to be enjoyed through the rest of the year. We had a different idea of what to do with blueberries. Our blueberries are fermented on the skins before being pressed and aged for at least nine months, with a portion aged in oak before being blended back in. The oak provides pronounced yet silky tannins to give great structure to the wine, and allow it to complement rich foods. The long aging time allows the character to fully develop and all the elements of the wine to come together smoothly. Beets have been a staple of Finnish country diet for centuries, and continues to be popular to the present day. Elo will evoke memories of the time you were a child in your grandmother’s kitchen. A strong earthy nose yields to a surprisingly balanced taste. With just enough residual sugar to call out the natural sweetness of beets, Elo is not your typical wine. Serve it with goat or blue cheese, liver, or other assertive foods. It holds its own and complements strong flavors. How do we capture this widely loved Finnish flavor that in a wine? We start by extracted the flavor from Finnish beet roots, and then adjust it by adding sugar and lemons (for acid) before fermenting using a modified white wine method. The wine is then aged in bulk for close to a year to tame an intense earthiness. During this time, a portion of the wine is intentionally oxidized and then blended back in to give sherry-like notes that contribute to its nuanced profile. "5/5 tähteä ... Tämä on yksi tyylikkäimmistä maistamistani glögeistä." Kaamos can be served warmed or chilled as a dessert wine. Brighter, fresher, lighter in body and less sweet than a traditional glögi. Made with lingonberries, honey and traditional glögi spices. Kaamos is naturally fermented, not fortified like many alcoholic Glögis being sold. We take a more challenging but better tasting route. Using difficult to ferment Finnish lingonberries, we use our own specially developed method to coax the yeast into producing just the right level of alcohol. We then add spices, sweeten with Finnish honey, and age at least two months before filtering and bottling. Light and fresh, Havu is a blush wine to accompany the first blush of warmth that arrives with spring. Made from Finnish forest lingonberries, honey and spruce tips. Enjoy it with fish, salads, berry desserts and lighter fair. Like our winter forest wine Kaamos, Havu is naturally fermented from wild forest lingonberries, then sweetened with Finnish honey. Havu is then flavored with young spruce tips collected in early May to give it a freshness from the forests that complements the wine’s acidity. Havu is aged in steel tanks at least two months before it is filtering and bottling.